"Terragen is a scenery generator, created with the goal of generating photorealistic landscape images and animations. It is available for Windows and the Mac OS." Terragen is a great piece of software that can be used to create landscape images. Images created using this program can be used to enhance photos of your miniatures or terrain, by combining your photo and the image from Terragen in photo editing software. Because Terragen automatically creates images and can use different textures to create a different environment, images can be produced quickly and there is no need to find photos to use as background images. Terragen can create images that can be used to represent different environments such as deserts, plains, mountains, and alien landscapes, and proves itself to be very versatile. 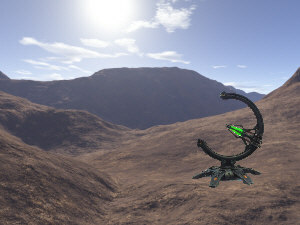 The above image was created in Terragen and the Necron Pylon was placed over the background image using Serif PhotoPlus 8. 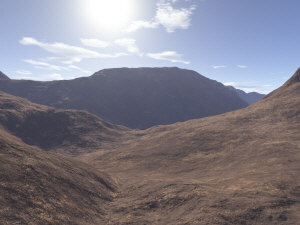 Terragen is free software and can be downloaded for Windows and Mac from http://www.planetside.co.uk/.